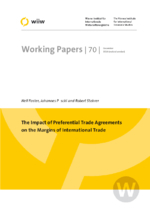 In this paper we consider the trade creating effects of Preferential Trade Agreements (PTAs) for a large sample of countries over the period 1960-2000. The paper builds upon the existing literature by examining whether any significant effects of PTAs occur through a change in the variety of exports (i.e. the extensive margin) or through a change in the volume of existing products (the intensive margin). To address this issue we employ the commonly used gravity equation as well as a matching approach to deal with potential self-selection problems. Our results indicate that exports respond positively to the formation of a PTA between countries, and that much of this increase in exports occurs along the extensive margin. We also show that the gains are strongest for larger trading partners, with again much of the benefits occurring along the extensive margin.